Do I have clarity for what God has called me to? Sometimes we forget what we’re (the church, my ministry) is really about. Churches tend to stay locked in the way they were when they started the church. For example, if they started in 1986, they want to keep everything in the church like 1986.They resist adapting to the culture. Our job (as tech people) is to make it easy for everyone to hear and accept the gospel. Can this be achieved without mics, speakers, and lighting? Yes, but it’s a lot easier if people can hear and see the pastor. I ended the day by attending a breakout session with Brad Weston of Renewed Vision. This company makes worship lyric presentation software called ProPresenter. LifeChurch.tv just completed updating all of our campuses to ProPresenter. It is working out really well for us. Renewed Vision also makes a software product, ProVideoPlayer, that stretches an video or computer image across multiple projectors or monitors. It’s a very cool product. I’m looking forward to hearing Rex Miller speak at tomorrow’s keynote. The day turned out pretty well. There weren’t any keynote sessions today; just breakout sessions. I went to sessions about video switching, video venues, and lighting. I was a little disappointed by the lighting session. It was advertised as “Creating Impact with Light”, but it was really just a product demo for a lighting manufacturer. The lights were cool, but I probably wouldn’t have attended if I knew it was a demo. The day ended with a tour of a church about an hour away from the city. It’s called Grace Community Church in Noblesville, Indiana. They are in the process of creating some new sanctuary spaces in their building. I know the architect that designed their new space and was eager to see his work in person. It was very cool. He spent a lot of time designing the sanctuary to feel intimate even though it can accommodate approximately 1500 people. I’ll post some pictures of the space later this week. I’m looking forward to tomorrow’s keynote. Mark Beeson, senior pastor of Granger Community Church will be speaking. I’ll write more about Granger later in the week as well. It was a good day for flying. I flew from Will Rogers World Airport (italics mine) in Oklahoma City to Houston and then on to Indianapolis. The weather was great and there were no delays. I was wanted to try out the paperless board pass that Continental is testing out, but I wasn’t given that option when I checked in. Oh well, maybe next time. 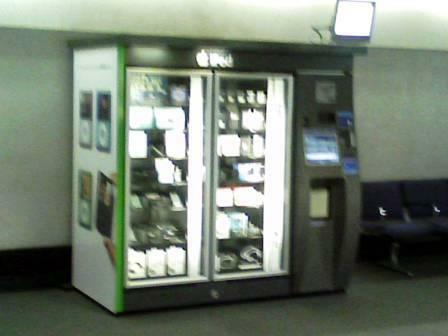 As I was headed to baggage claim at the Indianapolis airport, I came across an Apple iPod vending machine. I hadn’t seen one of those before. The pictures of it are below. 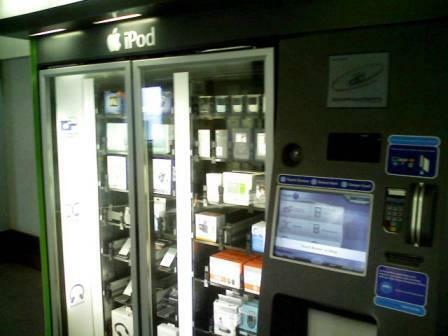 Could a vending machine for MacBook Pros be far behind? I’m looking forward to Day 1 of the WFX conference. I’ll be attending some sessions on video switchers, projection and lighting. I’ll post some stuff on it tomorrow. On Monday, I’m travelling to Indianapolis to attend the WFX conference. This is a conference for church architectural and tech stuff. I’m going for the tech stuff, like sound, video, lighting, etc. If you’re going to this conference, please contact me. Maybe we can meet up there. You can contact me via Twitter, Facebook, or just leave me a comment here. I found out that the TSA and Continental Airlines is testing out a paperless boarding pass for flights out of Houston. Essentially the barcode that is usually on the paper boarding pass is sent to you via email and you scan the barcode that is on your phone or PDA screen. I’ll give it a try as I go through Houston and let you know how it works out. Well, not *my* wedding. I’m talking about the first wedding that I officiated as a pastor. It was exactly one week ago. I was pretty nervous, but God knew what I could handle and gave me a pretty low key wedding to officiate. I’m thankful that I stepped out of my comfort zone and did it. I’m also thankful for those pastors who gave great advice and for everyone who prayed for me. Last Saturday, I was giving up to the minute updates via Twitter. I thought it would be interesting to post those updates here. If you follow me on Twitter, you’ve seen these updates already. If not, here they are. In true Twitter fashion, start from the bottom of the post and work your way back up. If you’d like to start following me on Twitter, just click here. Hey…what’s been going on in the Sunny world? Where to start…Let me begin by praising God for selling my house in Illinois. In December, I moved from Illinois to start my new job at LifeChurch.tv in Oklahoma. We left our house unoccupied and prayed someone would eventually buy it. It finally sold last week after being on the market for 5.5 months. I’m so thankful that I don’t have to pay two mortgage payments a month anymore. It’s also nice not having to write checks for two sets of water bills, electric bills, etc. This story could have been much worse. It seems, everyday, I’ve been reading articles about foreclosures being at record highs. Thankfully, God provided the resources for us to pay the bills. I didn’t know how we were going to continue to do that past this month, but thankfully, God provided the solution at the perfect time. Thanks God. And thank you for your prayers and encouragement.